The Lemmings are on the move! These adorable but stupid creatures walk off cliffs, wander mindlessly into flames and drop like rocks into pools of water. They need you to help them dig, build and blast their way to safety through 120 challenging levels. 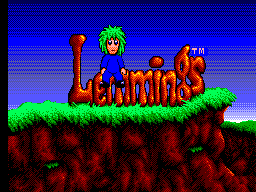 When the Lemming pulls the Sega logo across the screen, hold 1 + 2 and press Left, Right, Up, Down, Left, Right. You should hear a confirmation sound. 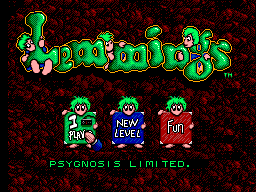 When the title screen appears, choose your difficulty level, then go on to the New Level box and press Right (or Left) to increase (or decrease) the starting level. Now simply press Button 2 to return to the menu screen and choose the One Player box to play the selected level. 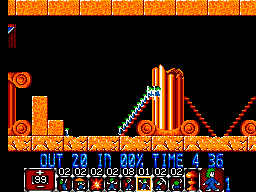 Level maps (by Maxim) in .ZIP format. 340kb in size.